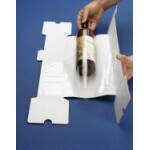 Korrvu Retention / Suspension Packaging for Laptops, Bottles, Mobile Phones, iPads and other Tables. Wondering how to safely post laptops, notebooks, wine, champagne or bottles of spirits? Sealed Air's Korrvu Retention / Suspension packaging provides a secure way to ship these notoriously awkward products. You can also view a step by step guide of how to assemble our laptop postal boxes and our iPad / Tablet postal boxes.